Specialist Predator Jigheads: We have produced a range of specialist jigheads to satisfy the requirements of the specialist predator hunter. 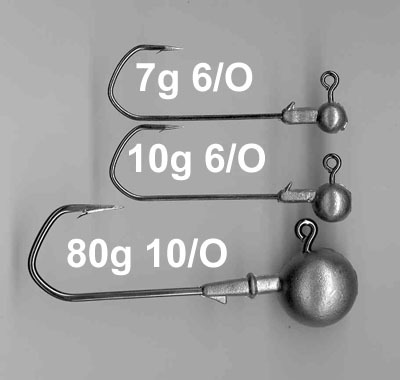 These are mostly outsized hooks or outsized weights or a combination of both. 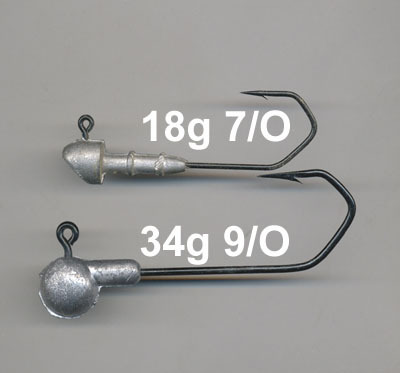 Please note VMC Barbarian hooks only come in “even” numbers; The 7/O’s and 9/O’s listed below are VMC “Blinkers” designed for jigging for catfish, see pictures below. See the Tips & Rigs page for how to rig a shad onto a jighead.